Nvidia Archives - HexByte Inc.
Pytorch implementation for high-resolution (e.g., 2048×1024) photorealistic video-to-video translation. It can be used for turning semantic label maps into photo-realistic videos, synthesizing people talking from edge maps, or generating human motions from poses. Install python libraries dominate and requests. If you plan to train with face datasets, please install dlib. If you plan to train with pose datasets, please install DensePose and/or OpenPose. Please first download example dataset by running python scripts/download_datasets.py. Next, download and compile a snapshot of FlowNet2 by running python scripts/download_flownet2.py. The test results will be saved in: ./results/label2city_2048/test_latest/. We also provide a smaller model trained with single GPU, which produces slightly worse performance at 1024 x 512 resolution. You can find more example scripts in the scripts/street/ directory. The test results will be saved in: ./results/edge2face_512/test_latest/. We use the Cityscapes dataset as an example. To train a model on the full dataset, please download it from the official website (registration required). We apply a pre-trained segmentation algorithm to get the corresponding semantic maps (train_A) and instance maps (train_inst). Please add the obtained images to the datasets folder in the same way the example images are provided. We use the FaceForensics dataset. We then use landmark detection to estimate the face keypoints, and interpolate them to get face edges. We use random dancing videos found on YouTube. We then apply DensePose / OpenPose to estimate the poses for each frame. First, download the FlowNet2 checkpoint file by running python scripts/download_models_flownet2.py. We adopt a coarse-to-fine approach, sequentially increasing the resolution from 512 x 256, 1024 x 512, to 2048 x 1024. If you have TensorFlow installed, you can see TensorBoard logs in ./checkpoints/label2city_1024/logs by adding --tf_log to the training scripts. We trained our models using multiple GPUs. For convenience, we provide some sample training scripts (train_g1_XXX.sh) for single GPU users, up to 1024 x 512 resolution. Again a coarse-to-fine approach is adopted (256 x 128, 512 x 256, 1024 x 512). Performance is not guaranteed using these scripts. To train the images at full resolution (2048 x 1024) requires 8 GPUs with at least 24G memory (bash ./scripts/street/train_2048.sh). If only GPUs with 12G/16G memory are available, please use the script ./scripts/street/train_2048_crop.sh, which will crop the images during training. Performance is not guaranteed with this script. If you haven’t, please first download example dataset by running python scripts/download_datasets.py. For single GPU users, example scripts are in train_g1_XXX.sh. These scripts are not fully tested and please use at your own discretion. If you still hit out of memory errors, try reducing max_frames_per_gpu. More examples scripts can be found in scripts/face/. Please refer to More Training/Test Details for more explanations about training flags. Example DensePose and OpenPose results are included. If you plan to use your own dataset, please generate these results and put them in the same way the example dataset is provided. Again, for single GPU users, example scripts are in train_g1_XXX.sh. These scripts are not fully tested and please use at your own discretion. If you still hit out of memory errors, try reducing max_frames_per_gpu. More examples scripts can be found in scripts/pose/. If your input is a label map, please generate label maps which are one-channel whose pixel values correspond to the object labels (i.e. 0,1,…,N-1, where N is the number of labels). This is because we need to generate one-hot vectors from the label maps. Please use --label_nc N during both training and testing. If your input is not a label map, please specify --input_nc N where N is the number of input channels (The default is 3 for RGB images). The default setting for preprocessing is scaleWidth, which will scale the width of all training images to opt.loadSize (1024) while keeping the aspect ratio. If you want a different setting, please change it by using the --resize_or_crop option. For example, scaleWidth_and_crop first resizes the image to have width opt.loadSize and then does random cropping of size (opt.fineSize, opt.fineSize). crop skips the resizing step and only performs random cropping. scaledCrop crops the image while retraining the original aspect ratio. randomScaleHeight will randomly scale the image height to be between opt.loadSize and opt.fineSize. If you don’t want any preprocessing, please specify none, which will do nothing other than making sure the image is divisible by 32. Using another generator which was trained on generating single images (e.g., pix2pixHD) by specifying --use_single_G. This is the option we use in the test scripts. Using the first frame in the real sequence by specifying --use_real_img. Forcing the model to also synthesize the first frame by specifying --no_first_img. This must be trained separately before inference. The way we train the model is as follows: suppose we have 8 GPUs, 4 for generators and 4 for discriminators, and we want to train 28 frames. Also, assume each GPU can generate only one frame. The first GPU generates the first frame, and pass it to the next GPU, and so on. After the 4 frames are generated, they are passed to the 4 discriminator GPUs to compute the losses. Then the last generated frame becomes input to the next batch, and the next 4 frames in the training sequence are loaded into GPUs. This is repeated 7 times (4 x 7 = 28), to train all the 28 frames. n_gpus_gen: the number of GPUs to use for generators (while the others are used for discriminators). We separate generators and discriminators into different GPUs since when dealing with high resolutions, even one frame cannot fit in a GPU. If the number is set to -1, there is no separation and all GPUs are used for both generators and discriminators (only works for low-res images). n_frames_G: the number of input frames to feed into the generator network; i.e., n_frames_G - 1 is the number of frames we look into the past. the default is 3 (conditioned on previous two frames). n_frames_D: the number of frames to feed into the temporal discriminator. The default is 3.
n_scales_spatial: the number of scales in the spatial domain. We train from the coarsest scale and all the way to the finest scale. The default is 3.
n_scales_temporal: the number of scales for the temporal discriminator. The finest scale takes in the sequence in the original frame rate. The coarser scales subsample the frames by a factor of n_frames_D before feeding the frames into the discriminator. For example, if n_frames_D = 3 and n_scales_temporal = 3, the discriminator effectively sees 27 frames. The default is 3.
max_frames_per_gpu: the number of frames in one GPU during training. If you run into out of memory error, please first try to reduce this number. If your GPU memory can fit more frames, try to make this number bigger to make training faster. The default is 1.
max_frames_backpropagate: the number of frames that loss backpropagates to previous frames. For example, if this number is 4, the loss on frame n will backpropagate to frame n-3. Increasing this number will slightly improve the performance, but also cause training to be less stable. The default is 1.
n_frames_total: the total number of frames in a sequence we want to train with. We gradually increase this number during training. niter_step: for how many epochs do we double n_frames_total. The default is 5.
niter_fix_global: if this number if not 0, only train the finest spatial scale for this number of epochs before starting to fine-tune all scales. batchSize: the number of sequences to train at a time. We normally set batchSize to 1 since often, one sequence is enough to occupy all GPUs. If you want to do batchSize > 1, currently only batchSize == n_gpus_gen is supported. no_first_img: if not specified, the model will assume the first frame is given and synthesize the successive frames. If specified, the model will also try to synthesize the first frame instead. fg: if specified, use the foreground-background separation model as stated in the paper. The foreground labels must be specified by --fg_labels. no_flow: if specified, do not use flow warping and directly synthesize frames. We found this usually still works reasonably well when the background is static, while saving memory and training time. For other flags, please see options/train_options.py and options/base_options.py for all the training flags; see options/test_options.py and options/base_options.py for all the test flags. no_canny_edge: do not use canny edges for background as input. no_dist_map: by default, we use distrance transform on the face edge map as input. This flag will make it directly use edge maps. densepose_only: use only densepose results as input. Please also remember to change input_nc to be 3.
openpose_only: use only openpose results as input. Please also remember to change input_nc to be 3.
add_face_disc: add an additional discriminator that only works on the face region. remove_face_labels: remove densepose results for face, and add noise to openpose face results, so the network can get more robust to different face shapes. This is important if you plan to do inference on half-body videos (if not, usually this flag is unnecessary). random_drop_prob: the probability to randomly drop each pose segment during training, so the network can get more robust to missing poses at inference time. Default is 0.2. If you find this useful for your research, please cite the following paper. We thank Karan Sapra, Fitsum Reda, and Matthieu Le for generating the segmentation maps for us. We also thank Lisa Rhee for allowing us to use her dance videos for training. We thank William S. Peebles for proofreading the paper. This code borrows heavily from pytorch-CycleGAN-and-pix2pix and pix2pixHD. Nvidia says the RTX 2080 is designed for overclocking, and the RTX 2070 will offer more performance (for ray-tracing) than Nvidia’s Titan XP card. The RTX 2080 Ti is the flagship, clocked at 1350MHz with 4352 CUDA cores and 11GB of GDDR6 RAM (full specs here), while the regular RTX 2080 will be clocked at 1515MHz with 2944 CUDA cores and 8GB of GDDR6 RAM (full specs here). The RTX 2070, meanwhile, is clocked at 1410MHz, with 2304 CUDA cores and 8GB of GDDR6 RAM. 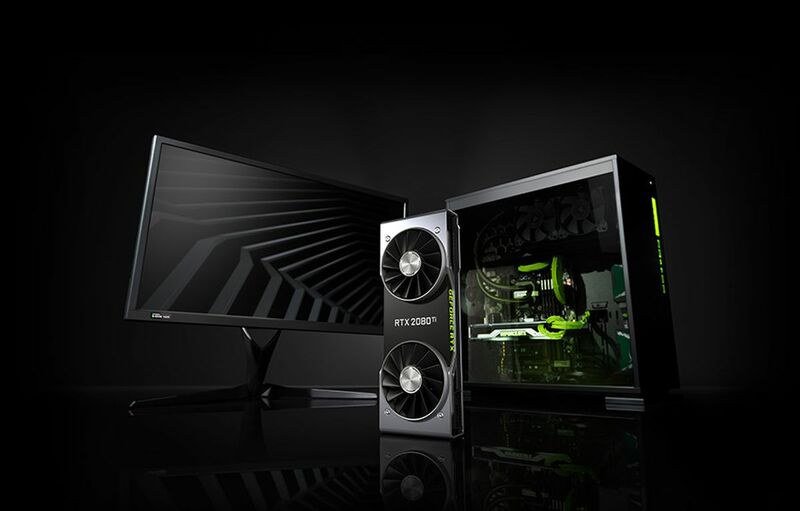 Nvidia is recommending PC gamers have a 650W power supply, as the base RTX 2080 draws up to 215 watts of power. The main promise of these new cards is ray tracing, which is a rendering technique that results in real-time light reflections and cinematic effects that can make games look a lot more like movies. Ray tracing is something PC gamers have been promised for years, and it has long been considered the “holy grail” of video games. Nvidia is now aiming to bring it in real time to the masses. The performance and ray-tracing support on the new RTX 2000 series is all thanks to it being based on Nvidia’s latest Turing architecture. “This is a new computing model, so there’s a new way to think about performance,” says Nvidia CEO Jensen Huang. “This new Turing processor is just a monster, it’s incredible.” Nvidia is now measuring its ray-tracing performance as a key target for these new cards. Huang showed off a number of demonstrations of existing cards and new rendering techniques with the RTX series. The ray-tracing demonstrations were impressive, but most were limited to physically modeled materials, and reflections and lighting indoors. It’s the real-world game support that matters, and Nvidia is promising real-time ray tracing in Shadow Of The Tomb Raider, and performance gains in lighting and other effects in Battlefield V and Metro Exodus. The demonstration of Tomb Raider was particularly impressive, with realistic shadows and lighting shown in nighttime scenarios. The Metro Exodus demo involved sunlight from a window entering a room through a window in real time, with Nvidia’s RTX rendering the light inside a room far more accurately so that game developers can hide enemies and other objects out of a view without having to light up the entire room in a non-realistic fashion. Battlefield V was easily the most impressive example of Nvidia’s RTX system. Reflections from explosions were accurately rendered onto nearby objects like cars, tanks, and even the ground and soldiers in the WW2 first-person shooter game. Flames and explosions will even reflect off of the metal on guns or even diffuse into the wooden parts of older guns in Battlefield V.
Nvidia is promising that even more games will get ray-tracing support than just the three titles it demonstrated today. The company briefly revealed 21 games will get RTX support soon, including Hitman 2, We Happy Few, PUBG, and Final Fantasy XV. 21 games is moderate for launch, but Nvidia will need to keep pushing game developers to adopt this new technology. Nvidia is also working with Microsoft to push ray-tracing, thanks to the company’s new DirectX Raytracing (DXR) API in Windows 10 to complement Nvidia’s RTX work. Epic Games will also make real-time ray-tracing available to Unreal Engine developers later this year. While Nvidia is claiming “6 times more performance” with its Turing RTX cards over its Pascal-based GTX GPUs, the company is attempting to redefine performance comparisons that are limited to how well the new cards perform. Nvidia doesn’t even list the traditional floating point operations per second (known as teraflops), and has opted to hype two new performance capabilities. These are RTX-OPS, an average of the card’s performance across operations like shading, ray-tracing, etc, and giga rays per second which measures how well the new cards can ray-trace. Nvidia didn’t spend 10 years building its GTX Pascal-based GPUs to perform ray-tracing, so the performance comparison here feels less relevant. We should get to spend more time with Nvidia’s latest RTX 2000 series at Gamescom this week, and we’re particularly interested to hear how the company will adapt these GPUs for laptops. Stay tuned for more information on Nvidia’s new RTX 2080.